Our course remains the conscience of humanity. As reported yesterday, the Zaytouna-Oliva has departed Messina with its course set for Gaza. Difficult weather conditions last night caused damage to her rigging. All on board are ok and she continues her course under engine power. Presently, we are considering our options for repair. We want everyone to know that the safety and well-being of all those on board remain our priorities. Join reporter Yudit Ilany as she spends a week with the Women’s Flotilla to Gaza, while it makes port calls in southern Europe, and ultimately attempts to break Israel’s blockade on Gaza. Lucia Intruglio, spokesperson and one of the local organisers in Messina said: “We are very pleased to host the women on Zaytouna-Oliva before they embark on this historic voyage.” During their stay in Messina, all of the women will participate in non-violence training, whilst finalizing supplies and equipment for the boat. 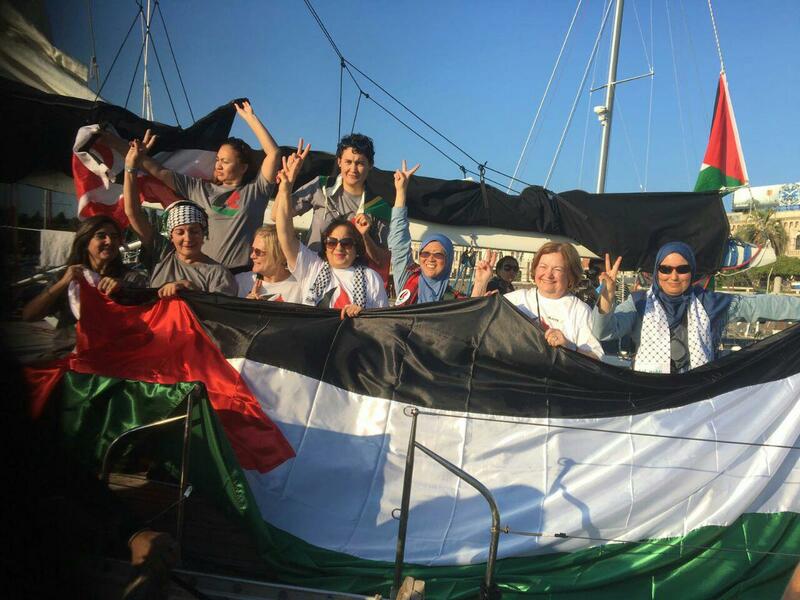 From September 12-14, the sailing vessels Amal-Hope and Zaytouna-Oliva will moor at Bosch i Alsina dock in the port of Barcelona where various events (concerts, talks, nonviolent workshops, a street parade and visits to the boats) will take place as farewell for the women leaving to break the blockade on Gaza. The boats will depart on September 14th to Ajaccio, France and then travel through another Western Mediterranean port before reaching the shores of Gaza in early October. For the Barcelona-Ajaccio leg, the passenger lists include Malin Björk, a Member of European Parliament from Sweden; Zohar Chamberlain Regev, an Israeli who currently lives in Spain and Ann Wright, a retired U.S. Army Colonel and former U.S. diplomat who resigned in 2003 in opposition to the invasion of Iraq. The women participants, who differ for each leg of the journey, represent over 15 countries across six continents. However, as Chamberlain Regev, who chairs WBG’s steering committee, explains “While we come from very different cultural and professional backgrounds, we all share a common bond. We find the blockade of Gaza and the occupation of Palestine absolutely unacceptable. And as long as governments continue to ignore this political-humanitarian crisis, we, as global citizens of goodwill, have no choice but to continue our efforts to break this inhumane blockade." For a schedule of program activities Barcelona, see here. Wendy Goldsmith (English) Spokesperson in Barcelona until departure (Sept. 14): (+34) 691-179-722. Les bateaux partiront le 14 septembre d’Ajaccio en Corse (France) pour se rendre dans un autre port de la côte ouest de la Méditerranée avant de rejoindre les rives de Gaza au début d’octobre. Pour l’étape Barcelone-Ajaccio la liste des passagères comprend Malin Björk, députée suédoise au Parlement européen; Zohar Chamberlain Regev, une israélienne vivant en Espagne et Ann Wright, une colonelle retraitée de l’armée américaine et ancienne diplomate qui a démissionné de son poste en 2003 pour protester contre l’invasion de l’Irak par les États-Unis. Les femmes montant à bord des bateaux, et dont le nombre varie selon les étapes, représentent plus de 15 pays venant de six continents. Par ailleurs comme l’explique Chamberlain Regev, qui préside le comité de coordination du Bateau des femmes pour Gaza : Même si nous venons d’horizons culturels et professionnels très différents, nous partageons toutes un même engagement. Nous pensons que le blocus de Gaza et l’occupation de la Palestine sont absolument inacceptables. Et tant et aussi longtemps que les gouvernements continueront d’ignorer cette crise politico-humanitaire, nous, en tant que citoyennes du monde et femmes de bonne volonté n’avons d’autre choix que de poursuivre inlassablement nos efforts pour briser ce blocus inhumain. Wendy Goldsmith (anglais) porte-parole à Barcelone jusqu'au départ (14 september ): (+34) 691-179-722. In a ruling issued by the Supreme Court of Israel, under the presidency of Miriam Naor, the state of Israel is ordered to immediately release and return the vessel ”Estelle” to its owners, the Swedish human rights organisation Ship to Gaza. The ship was boarded and seized by IDF in the fall 2012 during an attempt to break the inhumane blockade of the Palestinian enclave of Gaza. The Finnish flagged S/V Estelle departed from Sweden in early summer of 2012. It visited ports in the Baltic, the Atlantic and the Mediterranean before it was attacked by Israeli military, 30 naval miles outside the coast of Gaza. The Supreme Court ruled that the state should have immediately asked the court for the confiscation of the ship and shouldn’t have waited for ten months. The state did not conduct negotiations with the owner of the ship, did not respond to appeals by the owners and did not inform the owners about its intentions. According to the ruling the state of Israel is required to pay the court costs of Ship to Gaza at the amount of 40000 NIS (approx 10500 USD). Ship to Gaza will via our Israeli lawyers bring our claims against the state of Israel. Together with its partners in Freedom Flotilla Ship to Gaza is right now planning a new action to break and abolish the devastating blockade of Gaza: Women´s Boat to Gaza will set sail in the middle of September.